Should you prepare for an Emergency? Is it doomsday already? I recently received an email newsletter from a “modern” homestead blogger that pointed out the recent emergencies around North America — the Earth quakes in the East on August 22-25 and Hurricane Irene that was barrelling up the coast over the weekend. She pointed out that the stores ran out of food and the gas stations ran out of gas, in short order, as people stocked up on bottled water, and groceries before the emergency. Ms. Blogger pointed out that many homes were without power, after the hurricane, and the power wouldn’t be back on for weeks in some places. I, too have been encouraging you to stock up now and prepare for emergencies — that seem more frequent now than they did 10 years ago. But here the similarities end. Maybe I’m an Old Homesteader, rather than a modern homesteader. I’ve been telling you to prepare this summer for the coming winter. Buy food in season, at the peak of freshness, and can it, dry it, freeze it, ferment it, jam it — so that you can eat well in the off-season, saving money and increasing your nutrition. You will be prepared for any emergency, if you are prepared for winter. Ms Blogger suggests that you go out and buy a 72 hour emergency food storage kit with prepackaged food — she makes a small commission if you use her links. Don’t do it. Don’t buy into the FEAR! Instead make steady work toward your winter preparations and you will be ready for the emergency, if it comes. You will also have more time to do what you love because you’ll spend less time shopping, and less money on food over the course of the year. Should you prepare for an emergency if you have winter food storage? Yes, do prepare a “bug-out” bag that you can grab on your way out the door. But you can take your emergency food preparation out of your winter food storage. Prepare some bags of dried beans and rice with spices and put them into a ziploc bag — just like you do when you go camping and you’re prepared. No expensive freeze dried foods. No storage space wasted on food you won’t like and will never eat. No GMOs or empty calories. So what do you need to put by for the winter? How long do you feel that you should stock up for? For us 10 months is the magic number because that’s how long we go from the killing frost in the Fall to when we can eat from our garden again. Your time frame might be a year or just 4 months. So rather than tell you to put by enough food for a certain time period, I’ll give you the basis for you to make the decision based on your own comfort level. Plan for 2,500 calories per person per day plus extras. Use the food that you eat now as the basis for your planning. Plan to buy in bulk. Store it in critter proof containers. Take into account food intolerances, allergies and dietary restrictions. 1/2 lb. of grain is 400 calories (approx. 1 cup dry) Allow 1 lb. of grain per person per day. (800 calories). We aim for 300 days or 10 months. Grain includes flour, wheat, rice, pasta, quinoa, corn meal, oatmeal, etc. So for us, that amounts to 1,000 lbs of grain. But it is divided with all the different kinds of grain, so its not as ominous as it sounds. No, we don’t have 10 garbage cans full of wheat berries! We leave the grain in the bags that it comes in. More about that tomorrow. Milk, for us, comes from our goats and cheese that we’ve made over the summer and frozen for future use. We consume our milk and cheese raw. If you don’t have your own dairy animal, I’d avoid pasteurized, homogenized and powdered milk. Substitute bone broths and soups made from meaty bones, for the minerals that you’d get from milk. You can prepare these ahead of time and can them with a pressure canner. Meat: If you have your own meat, can some for emergencies, using a pressure canner. Dry some jerky, too. Homemade jerky is better than store bought. We leave most of our meat on-the-hoof and butcher as needed. If you are buying beef, lamb or chicken, buy from local farmers that you know do not feed GM ingredients to their livestock. If in doubt, ask, before you buy. GM feeds go into the meat, eggs and milk and pass into you, if you eat it. Plan for the things that make your food taste good: Honey, organic sugar, maple syrup, spices, herbs, coffee, tea, chocolate — store enough of these to get through 1/2 of the winter and replace it as you use it up. Pay attention to price fluctuations and stock up when the price goes down. Don’t forget a short term water supply in your planning. We keep 5 x 5 gallon bottles of water stored. We’ve never had to use them and every summer we empty the water on the garden and refill the bottles for another season. But water is free. Better to be prepared. We have a Berkey water filter system that we use everyday and it will keep us in water, should there be an emergency, so we only plan for a week or two of drinking water needs. But we live in a water rich area. If you live where it is dry, plan for more water in your storage. This is the basis for figuring out your food supply needs. Most emergency rations do not offer you 2,000 to 3,000 calories a day. You won’t be able to live on emergency rations for very long without nutritional deficiencies. Most 72 hour emergency kits offer you energy bars or food substitutes that are low on nutrition, high on carbohydrates and fats. You can make better emergency rations from your winter food storage, if you think of camping supplies rather than “rations”. I’ll give you some recipes on Wednesday that taste good and are nutritionally dense and satisfying — great camping food that can be used to make up an emergency food kit, too. 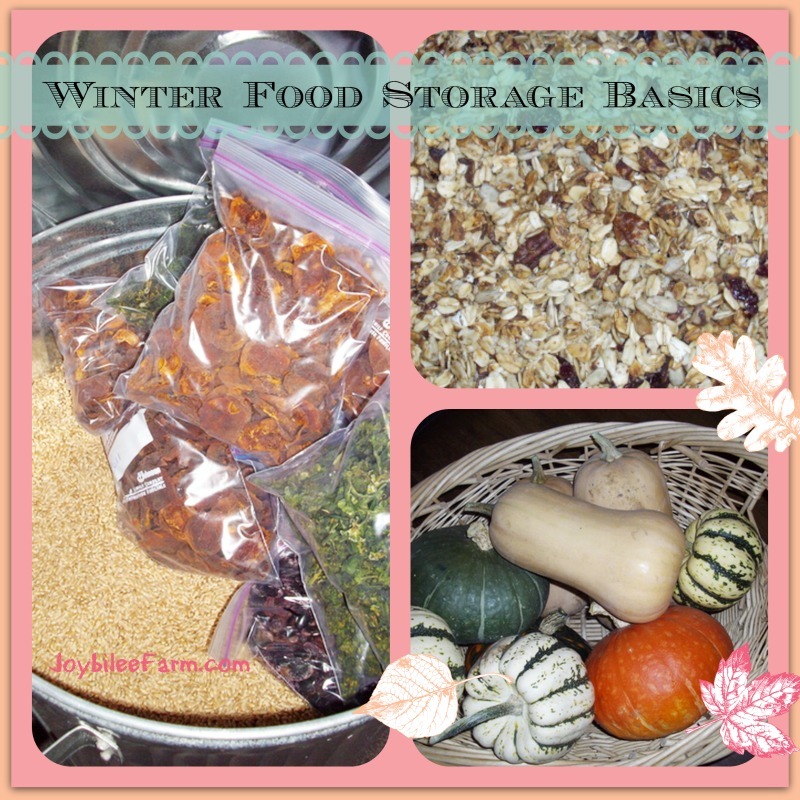 Tomorrow I’ll share our own winter food storage system with amounts to let you see how easy it is to begin a long term food storage system — preparing in the time of plenty for the season of scarcity. This is a system you can live with year round and actually eat from every day, with joy and thankfulness. I don’t have any emergency rations to sell you. Although there’s lots to choose from on Amazon. What I’m offering is a common sense approach to long term food storage. I hope you’ll start today to prepare a more sustainable and confident winter for your family. Good Articles and well written. I am always looking for such information.